You've heard of "the cat's meow?" This Sunday, Chattanooga is having "The Art's Meow," an Art Show and Celebration of Community Cats. and celebration on Sunday, October 13, 2013. 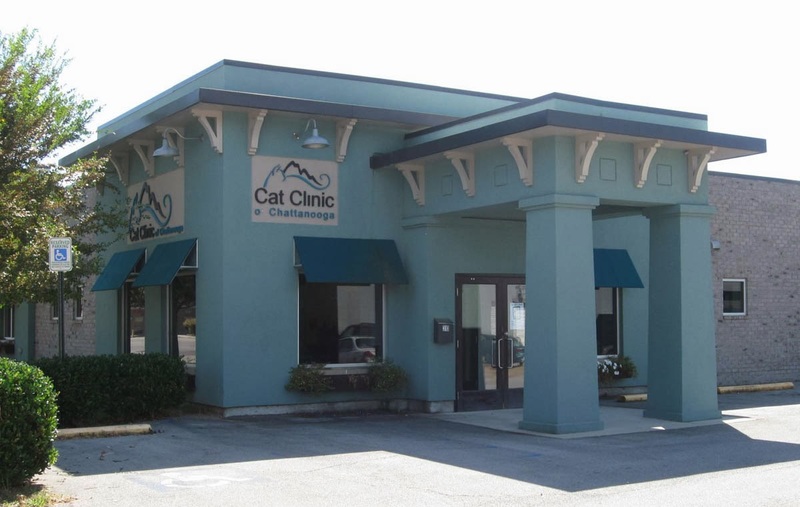 I learned of the event just this week after taking Luci, our "shared, community kitty," for his annual checkup at the Cat Clinic. Dr. Toumayan and the Cat Clinic staff (Jennifer, 'Lissa, Gabrielle and the rest) are wonderful, caring and compassionate professionals and helped organize the event to celebrate the Clinic's 5th anniversary. 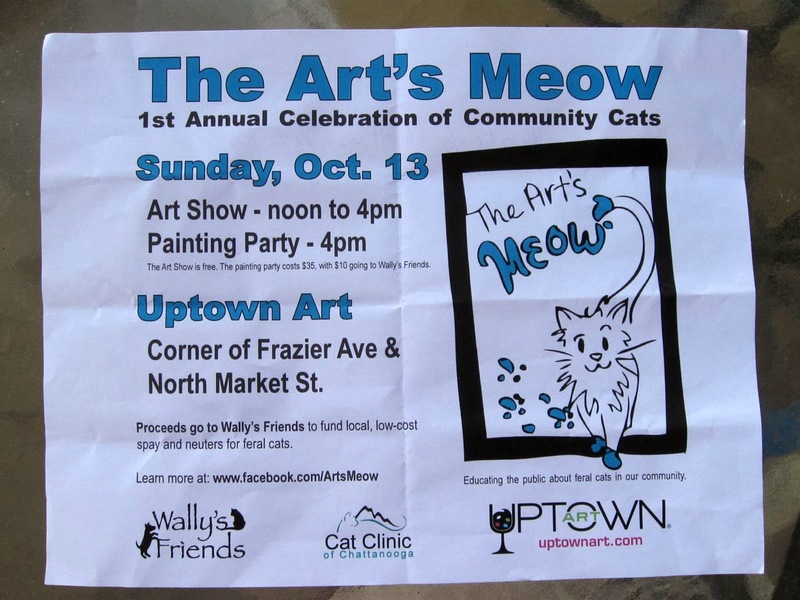 The art show and sale will benefit all the Chattanooga community cats with proceeds of the 50+ pieces of art—from paintings to jewelry—going to Wally's Friends. I couldn't help but contribute. 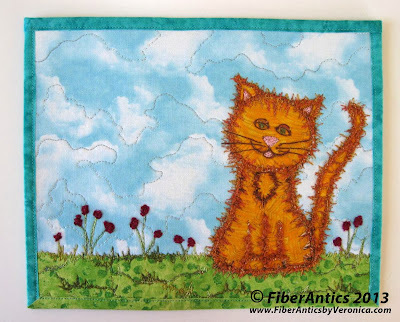 So, here is my little piece of kitty fiber art that will be for sale this Sunday, October 13. 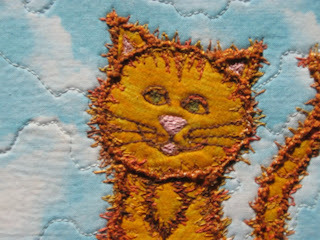 "Orange Cat" 10" x 8"
Free-motion embroidery on cotton fabrics. I've had a fat quarter bundle of "Elements of Nature" fabrics that have been looking for just the right project. This was it! 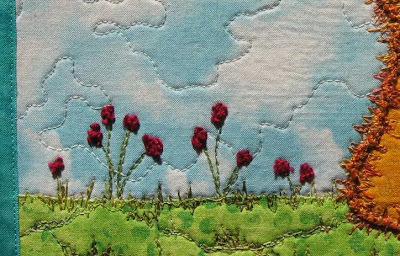 The sky cloud fabric from this bundle is the background of this piece. Free-motion embroidery and other threadwork techniques were used to embellish Orange Cat and the flowers and grass in the foreground. 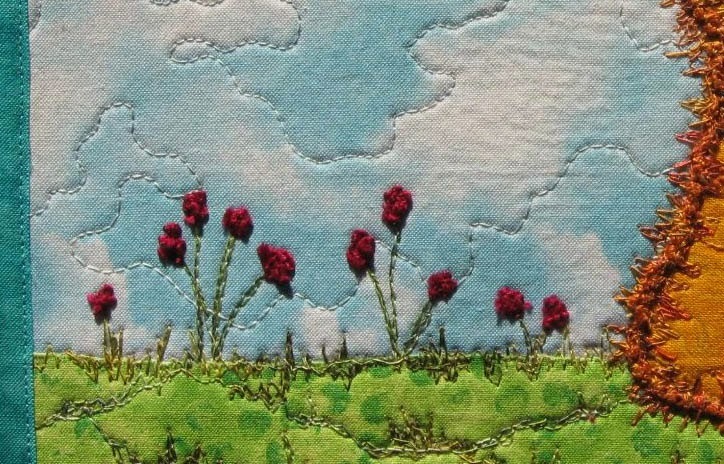 Detail of threadwork flowers and free-motion quilted clouds. 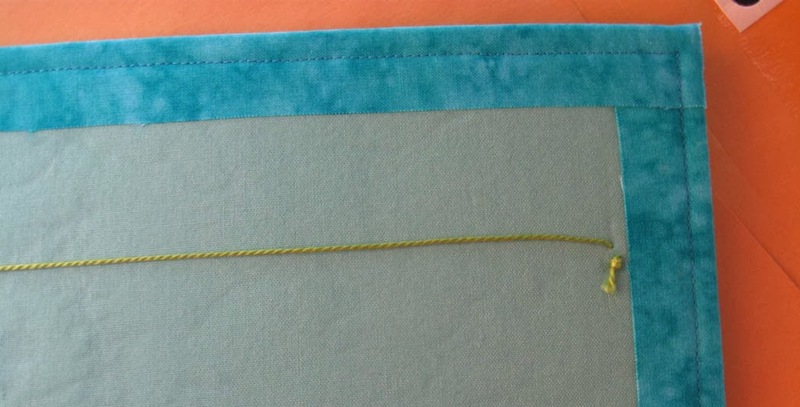 This piece also includes a cord on the back so it's ready for the wall. Or, it could be set on an easel or put in a shadowbox frame—all feasible display options. Hanging cord on the back. 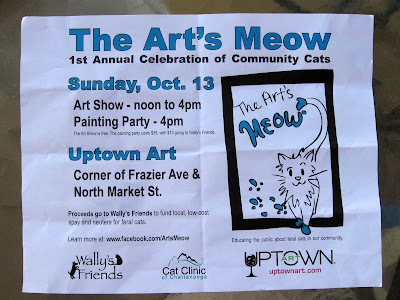 The Art's Meow event will take place from noon until 4 pm., this Sunday, October 13, at Uptown Art (corner of Frazier Avenue and North Market in Chattanooga). Come and join me at The Art's Meow and support Chattanooga's 4-legged kitty friends. The weather forecast is predicting purrrr-fect Chattanooga fall weather. So, take your family and friends out for cat art, b-day cake and ice cream and make it a kitty purrrr-fect day!